Speaker Type | Driver Size: Powered Full-Range / 12"
Powered Full-Range / 12" Powered Full-Range / 15"
Powered Full-Range / 2 x 15"
The single D.A.S. 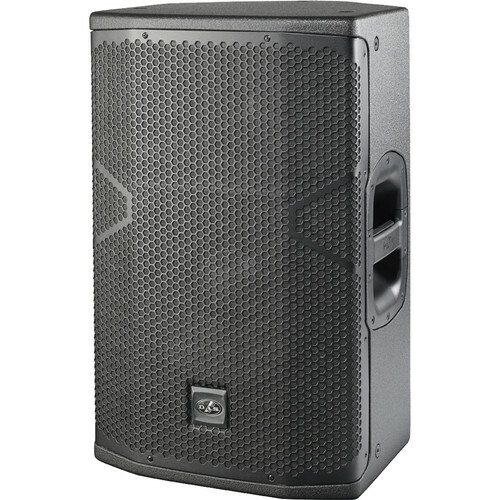 Vantec 12A is a powered, full-range, two-way loudspeaker with wireless Bluetooth audio, designed for professional live sound reinforcement applications, and can function as a compact PA or a floor wedge monitor. The built-in Class-D amplifier provides up to 1500W peak output, which drives the 12" woofer and 1" titanium compression driver that combine to provide frequency response of 60 Hz to 20 kHz and a peak SPL output of 135 dB. The rear panel offers two mic/line level XLR inputs and an XLR loop-thru output for connecting additional powered speakers. An 1/8" stereo aux input is included for connecting portable music players. The Vantec 12A utilizes Digital Finite Impulse Response (FIR) filters to provide a wide range of user configurable DSP voicing, filter, and EQ modes. Volume and DSP are controlled by the push-button volume level control, while an integrated LCD offers a clear view of settings. Additionally, the speaker uses Bluetooth to wirelessly stream music from a compatible Bluetooth device from up 65' away. The ISO-flex painted birch plywood enclosure offers a flexible, multi-angle design and allows the speaker to double as a floor monitor. Two bar handles are offered for ease in transport, while the steel grille provides ample protection to the loudspeaker's drivers. A 35mm speaker pole socket features two angles (0° / 10°) for flexibility in your setup. The D.A.S. Vantec 12A ships with a power cord.